Actually, the harpsichord played in the little parlor at Mount Vernon probably belonged to Washington’s step-granddaughter, Nelly Custis. The instrument was a gift from the President to 14 year old Nelly around 1793 and was delivered from London retailer Longman and Broderip. By all accounts it was a top-of-the-line harpsichord acquired as the piano was just coming into popularity. It was an extensively modified double keyboard harpsichord containing a complex plucking mechanism utilizing leather plectra rather than quill, a set of knobs and pedals which operated stops, and a Venetian swell. All allowed the user to play more expressively giving this particular harpsichord a mellower sound well suited to the changing demands of compositions of the period. According to conservators and music historians, these innovations made this particular harpsichord different from any other surviving period harpsichord in the US. Eventually Nelly’s harpsichord moved to Washington’s Mount Vernon in 1797 at the end of his second term, and except for a short stay at the home of Nelly’s brother, remained there in its original condition until 2016 when curators determined that the environment in that old mansion was not good for the preservation of the instrument. 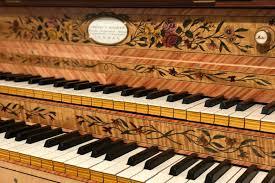 Mount Vernon called John Watson who is, as it happens, a builder of harpsichords. They commissioned him to build a playable replica which would become part of the Mount Vernon exhibit. And so the project was begun in Watson’s workshop using the original instrument, now housed in more friendly climes in Williamsburg, as a model for the building of the replica. This year and in 2020, Mr. Washington’s harpsichord will once again be played in his home to better depict the important role of music in the late 18th century American experience. Watson believes it will be close. How do you follow an act like that? Dr. Carol Williams, former full time Civic Organist in San Diego, CA, has moved to Virginia and is currently living in the Lynchburg area and serving as artist in residence at Court St. United Methodist Church in Lynchburg. She has been busy since moving. In addition to her church duties at the organ, she still plays organ concerts all over the world, including back in San Diego on the Spreckels organ in Balboa Park, composes, and produces CD’s of her own compositions and organ performances. In June, 2018 she organized the first Lynchburg (now Virginia) International Organ Festival, a week long festival bringing renowned organists from all over to Lynchburg to perform. That yearly festival will continue. The U. K. - born Williams studied at the Royal Academy of Music where it is reported that she got into trouble for playing ragtime instead of Rachmoninoff. When she finished her graduate studies at the Manhattan School of Music, she became the first woman civic organist in the world taking up the San Diego post in 2001, where she played weekly concerts on the world’s largest outdoor organ (see Alla Breve On-Line, December 2016). Now she plays weekly Sunday services at Court St. where she took over from retiring, long-time organist, George Clark who had been that church’s organist for 52 years. If we are lucky, we will get to hear her one day soon. Watch this space. This season, new alto section member Deb Price graciously volunteered to be the ticket manager for handling ticket distribution to chorus members and the general public. Like most of her fellow chorus members, Deb is a long-time choir and chorus singer and enjoys singing all types of music. She also enjoys hiking, learning about Virginia’s history, and, lucky for us, volunteering. Please, take a moment to thank Deb and her husband Jerry for taking on this important job for the RCS. If you are interested in learning more about any of the jobs that our volunteers do, please check in with the Friend’s Executive Director, Melanie Griffis-Hooper. Send her an email at admin@rcs.org to learn how you can use your non-vocal talents to help, or catch Melanie at one of our Monday night rehearsals, and thanks! On February 3, 2019 the Rockbridge Chamber Singers will travel through Europe musically with composers from Germany, England, Ireland, Scotland, France, and Italy with some old favorites and some new encounters. Among these is a collection of three lyric-driven French songs known as “Trois Chansons” by Claude Debussy. Arguably, Debussy changed the sound world of classical music forever in much the way that his contemporary, Monet, changed the art world. Debussy was not a slave to the Wagner worship of his day. He put forth his own musical aesthetic in fluid orchestral works like “Prelude to the Afternoon of a Faun”, and a few lovely choral works. His “Trois Chansons” have become icons in the classical choral music repertoire. These songs are set to poem texts by Charles D’Orleans, the 15th century French Duke of Orleans, who was captured at the battle of Agincourt in 1415 and imprisoned in England for the next 24 years. He was a prisoner of war to be sure, though as was true of many captives of royal descent, he lived quite well within his confines and wrote more than 500 poems while in England. Upon his release, he joked that he spoke English better than French. Did you take the quiz in the February 2018 issue of Alla Breve On-Line? Here are the songs. The answers are below. Happy Valentine's Day! Bonus: Which of these songs did Frank Sinatra say was "the greatest love song of the past 50 years"? The Friends of the RCS welcomes our first Art for A Song artist participants, Lee and Elizabeth Sauder, Rockbridge County artists and brother and sister-in-law of our own mezzo-soprano, Anne Sauder. The Sauders have donated two beautiful art works to kick us off for our raffle to be held in conjunction with the Rockbridge Choral Society's final concert of the 2016/2017 season - Rachmaninoff's Vespers. Please, join the chorus at 7 PM on April 2, 2017 at the Lexington Presbyterian Church, downtown Lexington, and enter for a chance to win. Read on for a bit about Elizabeth. You’ll encounter Elizabeth painting all over Rockbridge County, from a downtown Lexington street on a warm, fall evening at twilight to the middle of a barn-lot surrounded by curious calves on a snowy morning. Check out her work www.elizabethsauder.com or at Artists in Cahoots in Lexington. Elizabeth's donated work is titled Spring. She chose one of her favorite spots off of Turnpike Rd. and painted this lovely work over a few days in March 2016 "when the trees were first budding out and the grass was newly freshened with chlorophyll." She set her easel up in the field and painted what was in front of her, as is often her practice. Come to the concert and enter for a chance to win Spring. The Friends of the RCS welcomes our first Art for A Song artist participants, Lee and Elizabeth Sauder, Rockbridge County artists, and brother and sister-in-law of our own mezzo-soprano, Anne Sauder. The Sauders have donated two art works to kick us off with our first drawing which audience members can enter at our April 2, 2017 concert. Drawing will be held on April 3, and winners will be notified by mail or email. In today's post, learn a bit about Lee Sauder and his work. Lee is a blacksmith, bloomsmith, and sculptor. He has donated to the Friends of the RCS a work in wrought iron which he titles Reclining. Lee “digs up iron ore and transforms it into metal by the ancient and long-forgotten art of bloomery smelting…then tries to forge something beautiful out of the iron he’s made”. Lee produces his sculpture, architectural iron and customized furniture at his home forge, Germinal Ironworks, on the south slope of House Mountain right here in Rockbridge County. He started working in iron as a blacksmith’s apprentice at the age of 12. Today he is best known in the blacksmith community for his research into ancient iron smelting. He travels extensively to research and teach smelting techniques. 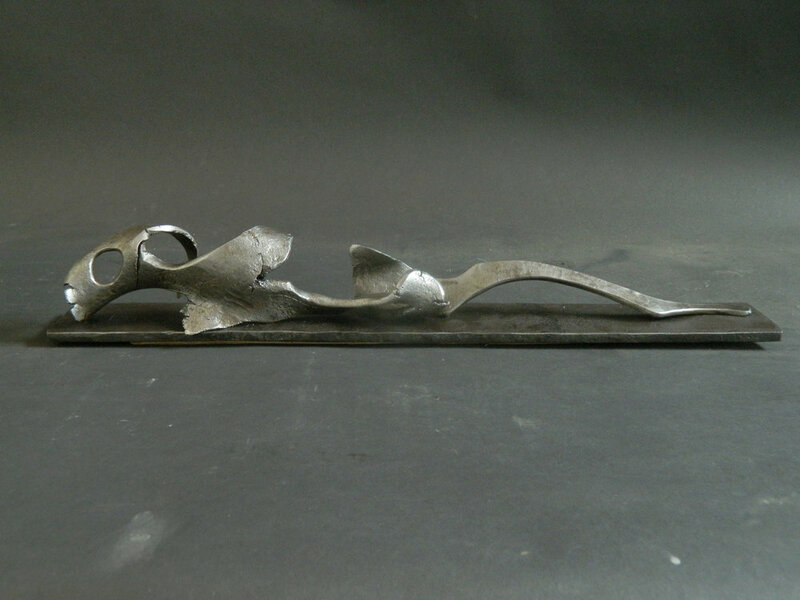 Check out Lee’s sculptures on his website http://www.leesauder.com and watch how bloom iron is made http://www.leesauder.com/smelting_video.php. The Friends of the Rockbridge Choral Society thanks Lee for his donation in support of the RCS and our first Art for A Song give-away. Our audience members will have a chance to enter and win Reclining on Sunday, April 2, 2017 when the RCS presents Rachmaninoff's Vespers as they close their 2015/2016 performance season. Please join us! On April 2, 2017, the Rockbridge Choral Society will present Sergei Rachmaninoff’s Vespers, and we hope you will join us for this ethereal musical setting of texts from the Russian Orthodox liturgical all-night vigil ceremony. It is often praised as Rachmaninoff’s finest achievement and was one of his own favorite works. As this performance season comes to a close, the Friends of the RCS is excited to say thanks to our loyal audience by inviting concert attendees to participate in our inaugural Art for A Song drawing. We are extremely grateful to two local artists, Lee and Elizabeth Sauder, for donating art works for our kick-off drawing, which will be held on Monday April 3, 2017. Our April 2nd concert audience members will be able to enter at the concert and the winners will be notified by email or mail. 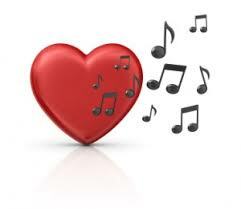 Stay tuned for more information on the artists and Art for A Song. If you are a local artist and would like to participate in future drawings, send an email to communications@rcs.org. The Rockbridge Choral Society rehearsed hard for our January 22, 2017 concert, which was a success. We had a super chamber orchestra, and as always we were blessed with our soloists. Gregory Parker, Nick Leitch, and Nate Pence listened and studied while the chorus did it's work. Our very fine cellist, John Moran, joined us again and kept us on track. Our ever reliable Evelyn P. McCorkle endowed concertmaster, Risa Browder, kept us all in line including the maestro. We thank them all for their time and talents! On to Rachmaninoff's Vespers on April 2, 2017! Astronomers have discovered something unexpected coming from the Perseus Cluster of galaxies which lies some 250 million light years from Earth. Dr. Andrew Fabian at the Institute of Astronomy, Cambridge, England has heard the lowest sound waves from an object in the universe ever detected by humans and coming from the center black hole of a cluster of galaxies which turns out to be the largest structure in the cosmos. Fabian’s team determined that this note is a B-flat some 57 octaves below middle-C, or one million, billion times lower than the lowest sound audible to the human ear. The Perseus Cluster’s black hole sound waves have a frequency of 10 million years! The lowest sounds a human can hear travel at about 1/20th of a second by comparison. Dear reader, your editor made C’s in physics, so this is all Greek, but suffice it to say that greater minds can tell us how black holes are ‘singing’ using NASA’s Chandra X-ray Observatory, an orbiting telescope that sees the Universe in X-ray frequencies just as the Hubble Space telescope sees it in visible light. Interesting to a musician to be sure, but to astronomers, this drone may be the key in learning how galaxy clusters, the largest structures in the Universe, grow. So, they are looking at other galaxy clusters to ‘hear’ more ‘singing’ black holes. The Friends would like to thank all our volunteers who work tirelessly to foster the work of the RCS and the RYC. Most come from the ranks of the RCS. These folks organize ticket distribution and sales, stage assembly, advertising through local media, poster distribution, program layout and design, housing for out-of -town soloists and players when needed, organizing and keeping track of the music catalog for the singers, party organization, etc. Yes, this is a long list of jobs. Over the years, the current holders of these crucial positions have put together the efficient systems which allow our singers to do the most important job - learning and presenting great choral music. We hope some new folks will be inspired to join our volunteer ranks. We could not do what we do without them. Anne Sauder (Soprano II) authors our concert programs. As we approach All Hallows Eve, here are a few stories surrounding the weird and untimely deaths of musicians. Seriously, you can’t make this stuff up. Enrique Granados died in 1916 at the height of his success. This Spanish nationalist composer was invited by President Woodrow Wilson to give a piano recital at the White House. When Granados and his wife missed the boat back to Spain, they procured passage to England and then boarded the Sussex ferry which would take them on to France. While crossing the English Channel, the Sussex was hit by a German U-boat torpedo. Granados, who had a life-ling fear of the ocean, drowned when he jumped out of his lifeboat in a valiant but futile attempt to save his wife. Jean-Baptiste Lully, the French Baroque master and King Louis XIV’s favorite opera composer, died in 1687 from a self-inflicted wound to his foot. He stabbed his foot with his own pointed staff (used for keeping time) while conducting a performance of his Te Deum. Resulting infection and gangrene killed him three months after he had dealt himself what turned out to be the fatal blow. Austrian composer, Anton Webern, was a pupil of fellow Austrian composer, Arnold Schoenburg. Webern died on September 15, 1945 just at the end of World War II. On this evening, he stepped outside to smoke a cigar, unaware that a curfew was being enforced by the Allied occupying forces. He was shot dead by an American soldier who saw him light up. Elijah was a sell out, and in no small measure, this is due to the work of one of our many volunteers. We are so fortunate to have the help of one of our singers, Rick Richter, who for many years has been our point man on ticket distribution and sales. Rick and his wife Janie spend part of their year in Lexington and part in Michigan, and Rick sings in the bass section of both the RCS and the Chamber Singers. In brief, ticket management involves proofing the ticket design before it goes to the printers and then distributing the tickets and keeping track of sales. Ahead of the concert date, tickets are distributed to the chorus members who pre-sell tickets, and to the two retail locations in downtown Lexington which, for years, have graciously pre-sold tickets - McCorkle's Hallmark and Books & Company. And, yes, Rick has a system to make it easy for the retail store sellers. The week of a concert, Rick collects remaining unsold tickets and the sales proceeds and then makes ready to sell tickets at the door on concert night. He has recruited volunteer ticket sellers who arrive early to sell tickets, and he makes sure the student volunteers at our W&L venues can check for tickets as they hand out programs. Rick says that the most critical thing he does is tracking tickets out and tickets sold when we are performing in smaller venues like Wilson Hall at the Lenfest Center, where there are only 300 seats. These concerts often sell out and there is over-flow in one of the adjacent rooms with video and sound, so keeping track of ticket count is crucial to make sure everyone who wants to attend can do so. After many years of faithful service in this most important role, Rick would like to turn the ticket system over to another volunteer(s) in the coming year, so if anyone is interested in apprenticing, please let Rick know. On Sunday evening April 24th, the Rockbridge Choral Society and a stellar orchestra completed it's 2015-2016 season with Mendelssohn's Elijah, and the house was packed! The Friends would especially like to congratulate our soloists - sopranos, Christine and Maggie Fairfield; alto, Toby Newman; tenor, Eric Hanson; and baritone, Keith Spencer, in the title role. Our soloists did not disappoint; they looked and sounded superb! We expect great things from Maggie, who follows in mom's (Christine's) footsteps. As always, the Lenfest Center staff - John Lindberg and Graham Spice - did their efficient and reliable work to help the RCS pull it off without a hitch. A couple of days later, on Tuesday, April 26, the Rockbridge Youth Chorale (RYC), directed by Lacey Lynch and Lori Parker, closed out our season with their spring concert held at the Lexington Presbyterian Church. These kids never disappoint. It was a fine program and well sung! The Friends of the RCS is so happy to support the efforts of this group. We are fortunate to be able to increase the stipends for our youth directors for the coming season and to be able to fund a paid intern to assist with the music education of our young singers. The intern position will be filled through application from music education majors currently enrolled at W&L and Southern Virginia University. We think this is an exciting addition to the youth choral experience. Great job all! We can't wait until next season and preparations are under way even as this season comes to an end.